The term Celts (pronounced "kelts" or "selts") were an Indo-European and ethno-linguistically diverse group of tribal societies in Iron Age and Roman-era Europe who spoke Celtic languages. The earliest archaeological culture that may justifiably be considered as Proto-Celtic is the Late Bronze Age Urnfield culture of central Europe from the last quarter of the second millennium BC. Their fully Celtic descendants in central Europe were the people of the Iron Age Hallstatt culture (c. 800-450 BC) named for the rich grave finds in Hallstatt, Austria. By the later La Tene period (c. 450 BC up to the Roman conquest), this Celtic culture had expanded over a wide range of regions, whether by diffusion or migration: to the British Isles (Insular Celts), France and The Low Countries (Gauls), much of Central Europe, the Iberian Peninsula (Celtiberians, Celtici and Gallaeci) and northern Italy (Golaseccans and Cisalpine Gauls) and following the Gallic invasion of the Balkans in 279 BC as far east as central Anatolia (Galatians). The earliest directly attested examples of a Celtic language are the Lepontic inscriptions, beginning from the 6th century BC. Continental Celtic languages are attested only in inscriptions and place-names. Insular Celtic is attested from about the 4th century in ogham inscriptions, although it is clearly much earlier. Literary tradition begins with Old Irish from about the 8th century. Coherent texts of Early Irish literature, such as the Tain Bo Cuailnge (The Cattle Raid of Cooley), survive in 12th-century recensions. By mid 1st millennium AD, following the expansion of the Roman Empire and the Great Migrations (Migration Period) of Germanic peoples, Celtic culture and Insular Celtic had become restricted to Ireland, to the western and northern parts of Great Britain (Wales, Scotland, Cornwall and the Isle of Man), and to northern France (Brittany). Between the fifth and eighth centuries the Celtic-speaking communities of the Atlantic regions had emerged as a reasonably cohesive cultural entity. In language, religion, and art they shared a common heritage that distinguished them from the culture of surrounding polities. The Continental Celtic languages ceased to be widely used by the 6th century. Insular Celtic culture diversified into that of the Gaels (Irish, Scottish and Manx) and the Brythonic Celts (Welsh, Cornish, and Bretons) of the medieval and modern periods. A modern "Celtic identity" was constructed in the context of the Romanticist Celtic Revival in Great Britain, Ireland, and other European territories, such as Galicia. Today Irish, Scottish Gaelic, Welsh, and Breton remain spoken in parts of their historical territories, and both Cornish and Manx are currently undergoing revival. Celts refers to any of a number of ancient peoples in Europe using the Celtic languages, which form a branch of Indo-European languages, as well as others whose language is unknown but where associated cultural traits such as Celtic art are found in archaeological evidence. Historical theories were developed that these factors were indicative of a common origin, but later theories of culture spreading to differing indigenous peoples have recently been supported by genetic studies. Though the spread of the Roman empire led to continental Celts adopting Roman culture, the development of Celtic Christianity in Ireland and Britain brought an early medieval renaissance of Celtic art between 400 and 1200. Antiquarian interest from the 17th century led to the term Celt being developed, and rising nationalism brought Celtic revivals from the 19th century in areas where the use of Celtic languages had continued. Today, "Celtic" is often used to describe the languages and respective cultures of Ireland, Scotland, Wales, Cornwall, the Isle of Man and the French region of Brittany, as many of the people in these regions have Celtic ancestry (see the Modern Celts article), but correctly corresponds to the Celtic language family - in which are still spoken: Scottish, Irish and Manx (Gaelic languages) and Welsh, Breton and Cornish (Brythonic languages). The Celtic language family is a branch of the larger Indo-European family, which leads some scholars to a hypothesis that the original speakers of the Celtic proto-language may have arisen in the Pontic-Caspian steppes. However, as the Celts enter history from around 600 BC, they are already split into several languages groups, and spread over much of Central Europe, the Iberian peninsula, Ireland and Britain, and studies now suggest that some of the Celtic peoples - including the ancestors of all the modern Celtic nations - had a largely pre-Celtic genetic ancestry, shared with the Basque people and possibly going back to the Palaeolithic. Some scholars think that the Urnfield culture represents an origin for the Celts as a distinct cultural branch of the Indo-European family. This culture was preeminent in central Europe during the late Bronze Age, from ca. 1200 BC until 700 BC, itself following the Unetice and Tumulus cultures. The Urnfield period saw a dramatic increase in population in the region, probably due to innovations in technology and agricultural practices. The spread of iron-working led to the development of the Hallstatt culture directly from the Urnfield (c. 700 to 500 BC). Proto-Celtic, the latest common ancestor of all known Celtic languages, is thought to have been spoken at the time of the late Urnfield or early Hallstatt cultures, in the early 1st millennium BC. The spread of the Celtic languages to Britain and to Iberia would have occurred during the first half of the 1st millennium, the earliest chariot burials in Britain dating to ca. 500 BC. Over the centuries they developed into the separate Celtiberian, Goidelic and Brythonic languages. Whether Goidelic and Brythonic are descended from a common Insular-Celtic language, or if they reflect two separate waves of migration is disputed. The La Tene culture, in any case, can be associated with the Gauls, but it is entirely too late for a candidate for the Proto-Celtic culture. Additional forays into Greece and central Italy during the historical period did not result in settlement, though the same movement that brought Celtic invaders to Greece pushed on through to Anatolia, where they settled as the Galatians. Stonehenge and the other megalithic monuments long predate the Iron Age Celtic culture, but Genetic evidence indicates that the Celtic populations of the Atlantic Archipelago have been relatively stable for at least 6,000 years, in which case the modern Celts would be the direct descendants of their builders. There is no evidence that they used these sites as areas of worship from the Iron Age on, however, and indeed most evidence suggest that the Druidic Celtic religion(s) preferred to use groves of Oak trees as places of worship. The connection between these monuments and the Celts largely stems from 18th century romantics such as William Stuckeley. The indigenous populations of Britain and Ireland today are primarily descended from the ancient peoples that have always inhabited these lands. As to their culture, little is known but remnants remain primarily in the naming of certain geographical features, such as the rivers Clyde, Tamar, Thames and Tyne. By the Roman period most of the inhabitants of the isles of Ireland and Great Britain (the ancient Britons) were speaking Goidelic or Brythonic languages, close counterparts to Gaulish languages spoken on the European mainland. Historians explained this as the result of successive invasions from the European continent by diverse Celtic-speaking peoples over the course of several centuries. In 1946 the Celtic scholar T. F. O'Rahilly published his extremely influential model of the early history of Ireland which postulated four separate waves of Celtic invaders. What languages were spoken by the peoples Ireland and Britain before the arrival of the Celts is unknown. Later research indicated that the language and culture had developed gradually and continuously, and in Ireland no archaeological evidence was found for large intrusive groups of Celtic immigrants, suggesting to historians such as Colin Renfrew that the native Late Bronze Age inhabitants gradually absorbed influences to create "Celtic" culture. The very few continental La T�ne culture style objects which had been found in Ireland could have been imports, or the possessions of a few rich immigrants. Julius Caesar had written of people in Britain who came from Belgium (the Belgae), but archaeological evidence which was interpreted in the 1930s as confirming this was contradicted by later interpretations and it was suggested that there might have been only a handful of �lite Belgae in Britain. In the 1970s this model was popularised by Colin Burgess in his book The Age of Stonehenge which theorised that Celtic culture in Great Britain "emerged" rather than resulted from invasion and that the Celts were not invading aliens, but the descendants of the people of Stonehenge. More recently a number of genetic studies have supported this model of culture being absorbed by native populations. The study by Cristian Capelli, David Goldstein and others at University College, London showed that genes associated with Gaelic names in Ireland and Scotland are also common in Wales, Cornwall and most parts England, and are similar to the genes of the Basque people, who speak a non-Indo-European language. This similarity supported earlier findings in suggesting a largely pre-Celtic genetic ancestry, possibly going back to the Paleolithic. They suggest that 'Celtic' culture and the Celtic language were imported to Britain by cultural contact not mass invasions, either by Indo-Europeans bringing farming or by Celts in 600 BC. Some recent studies have suggested that, contrary to long-standing beliefs, the Teuton tribes did not wipe out the Romano-British of England but rather, over the course of six centuries, conquered the native Brythonic people of what is now England and south east Scotland and imposed their culture and language upon them, in a manner similar to the Irish spread over the west of Scotland. Under Caesar the Romans conquered Celtic Gaul, and from Claudius onward the Roman empire absorbed parts of the Celtic British Isles. Roman local government of these regions closely mirrored pre-Roman 'tribal' boundaries, and archaeological finds suggest native involvement in local government. Latin was the official language of these regions after the conquests.The native peoples under Roman rule became Romanized and keen to adopt Roman ways. Celtic art had already incorporated classical influences, and surviving Gallo-Roman pieces interpret classical subjects or keep faith with old traditions despite a Roman overlay. 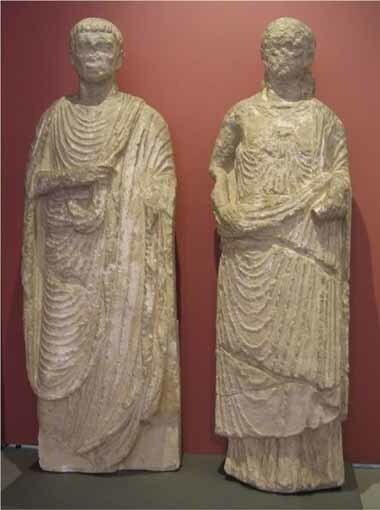 Roman influence lead directly to the decline of the druidic priests. 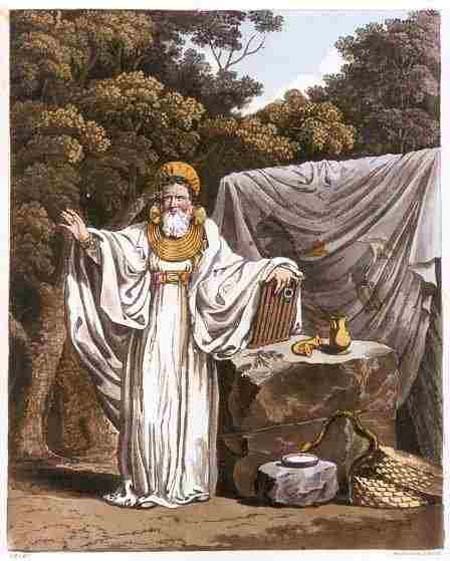 Prior to Roman conquests, the druids exercised enormous spiritual and political power among the celtic peoples. The druidic religion was seen as a major impediment to the "Romanization" of the newly conquered celts. Thus began a deliberate policy on the part of the Roman conquerors to replace the old celtic political structure with Roman institutions. The elimination of the druidic class was instrumental to cementing Roman authority. This led the birth of many Romano-celtic deities, as old celtic gods took on new latin names and aspects of Roman divinities, and began to be worshipped alongside the more traditional Jovian pantheon. Gallo-Roman Culture describes the Romanized culture of Gaul under the rule of the Roman Empire. This was characterized by the Gaulish adoption or adaptation of Roman mores and way of life in a uniquely Gaulish context. The well-studied meld of cultures in Gaul give historians a model against which to compare and contrast parallel developments of Romanization in other, less-studied Roman provinces. While the regions under Roman rule adopted Christianity along with the rest of the Roman empire, unconquered areas of Ireland and Scotland moved from Celtic polytheism to Christianity in the 5th century. Ireland was converted under missionaries from Britain, such as Patrick. Later missionaries from Ireland were a major source of missionary work in Scotland, Saxon parts of Britain, and central Europe (see Hiberno-Scottish mission). 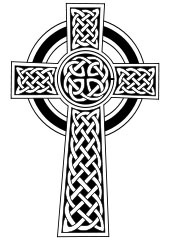 The term Celtic Christianity has been applied to the forms of Christianity that took hold in Britain and Ireland at this time, with especial reference to its traditions that were distinct from the rest of Western Christianity. The development of Christianity in Ireland and Britain brought an early medieval renaissance of Celtic art between 390 and 1200 AD. Many of the styles now thought of as typically "Celtic" developed in this period, and are found throughout much of Ireland and Britain, including the northeast and far north of Scotland, Orkney and Shetland. Notable works produced during this period include the Book of Kells and the Ardagh Chalice. Antiquarian interest from the 17th century led to the term Celt being extended, and rising nationalism brought Celtic revivals from the 19th century. Celts were pushed westwards by successive waves of Germanic invaders, perhaps themselves at times pressured by Huns and Scythians or simply population pressures in their homeland of Scandinavia and Northern Germany. With the fall of the Roman Empire the Celts of Gaul, Iberia and Britannia were "conquered" by tribes speaking Germanic languages. Elsewhere, the Celtic populations were assimilated by others, leaving behind them only a legend and a number of place names such as Bohemia, after the Boii tribe which once lived there, or the Kingdom of Belgium, after the Belgae, a Celtic tribe of Northern Gaul and south-eastern England. Their mythology has been absorbed into the folklore of half a dozen other countries. For instance, the famous Medieval English Arthurian tale of Sir Gawain and the Green Knight is almost certainly partially derived from the medieval Irish text Fled Bricrend (The Feast of Bricriu). Argument rages in the academic world as to whether the Celts in England were mostly wiped out/pushed west as the lack of evidence for influence of the Celts on Anglo-Saxon society suggests, or whether the Teuton migration consisted merely of the social elite and that the genocide was cultural rather than physical due to such relatively few numbers of Anglo-Saxons mixing with the far larger native population, enabled to do so due to the civil strife in Britain after the Roman withdrawal and the unity of the incoming invaders. Some recent DNA studies have suggested that the population of England maintains a predominately ancient British element, equal in most parts to Cornwall and Wales. The general indigenous population of Yorkshire, East Anglia and the Orkney and Shetland Islands are those populations with the least traces of ancient British continuation. Ironically, it may be Viking genetic influence and not Anglo-Saxon which has had a more profound impact on British bloodlines. Although Celtic gods varied from region to region and tribe to tribe, the Celtic religion had some patterns. Celtic polytheism or Celtic paganism, refers to the religious beliefs and practices adhered to by the Iron Age peoples of Western Europe now known as the Celts, roughly between 500 BCE and 500 CE, spanning the La Tene period and the Roman era, and in the case of the Insular Celts the British and Irish Iron Age. The Celtic pantheon consists of numerous recorded theonyms, both from Greco-Roman ethnography and from epigraphy. Among the most prominent ones are Teutatis, Taranis and Lugus. Figures from medieval Irish mythology have also been adduced by comparative mythology, interpreted as euhemerized versions of pre-Christian Insular deities. The most salient feature of Celtic religion as reflected in Roman historiography is their extensive practice of human sacrifice, According to Greek and Roman accounts, in Gaul, Britain and Ireland, there was a priestly caste of "magico-religious specialists" known as the druids, although very little is definitely known about them. Following the Roman Empire's conquest of Gaul (58-51 BCE) and southern Britannia (43 CE), Celtic religious practices began to display elements of Romanisation, resulting in a syncretic Gallo-Roman culture, with its own religious traditions with its own large set of deities, such as Cernunnos, Artio, Telesphorus, etc. In the later 5th and the 6th centuries, Christianity became the dominant faith in the Celtic area, supplanting earlier religious traditions. However, it left a legacy in many of the Celtic nations, influencing later mythology, and served as the basis for a new religious movement, Celtic Neopaganism, in the 20th century. For example like Mediterranean cultures most early Celts worshipped in sacred groves. This was once postulated to have occurred because of Celts trading with Mediterranean cultures; however, evidence from Hallstatt era finds show that the earliest Celts practiced this before such trade took place. More reasonably, it is a byproduct of most primitive religion to worship in such a way. However, La Tene Celts also built temples of varying size and shape, though they still usually maintained sacred trees, or votive pools. Worship was, in this way, deferred to temples, when they were available. Numerous temples were converted by the Romans, and with little difficulty; the design was rather similar to Roman temples, as they were both highly influenced by the Greeks, architecturally speaking. Their druid influences vary; a druid is not always a priest. Druids are any members of a Celtic society who had what we would view today as a college education. The most educated druids were usually doctors, priests, and heralds, as these occupations required the most memorization and skill for their practices. The pre-Christian Celts had a well-organized social structure, based on class and kinship, with the religion we call Celtic polytheism. Elected Kings led the tribes, and society was divided into three groups: a warrior aristocracy, an intellectual class including druids, poets, and jurists, and everyone else. Women participated both in warfare and in kingship, and all the offices of high and low kings were filled by election under the system of tanistry, both factors which would confuse Norman writers expecting the feudal principle of primogeniture where the succession goes to the first born son. Little is known of family structure, but Athenaeus in his Deipnosophists, 13.603, claims that "the Celts, in spite of the fact that their women are very beautiful, prefer boys as sexual partners. There are some of them who will regularly go to bed - on those animal skins of theirs � with a pair of lovers," implying with a woman and a boy. In the main, the evidence is of tribes being led by kings, although some argue that there is also evidence of oligarchical republican forms of government eventually emerging in areas which had close contact with Rome. Most descriptions of Celtic societies portray them as being divided into three groups: a warrior aristocracy; an intellectual class including professions such as druid, poet, and jurist; and everyone else. In historical times, the offices of high and low kings in Ireland and Scotland were filled by election under the system of tanistry, which eventually came into conflict with the feudal principle of primogeniture in which succession goes to the first born son. 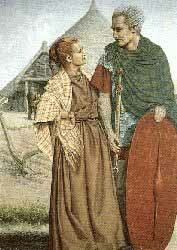 Little is known of family structure among the Celts. Patterns of settlement varied from decentralized to urban. The popular stereotype of non-urbanised societies settled in hillforts and duns, drawn from Britain and Ireland (there are about 3,000 hill forts known in Britain) contrasts with the urban settlements present in the core Hallstatt and La Tene areas, with the many significant oppida of Gaul late in the first millennium BC, and with the towns of Gallia Cisalpina. Slavery, as practiced by the Celts, was very likely similar to the better documented practice in ancient Greece and Rome. Slaves were acquired from war, raids, and penal and debt servitude. Slavery was hereditary, though manumission was possible. The Old Irish word for slave, cacht, and the Welsh term caeth are likely derived from the Latin captus, captive, suggesting that slave trade was an early venue of contact between Latin and Celtic societies. In the Middle Ages, slavery was especially prevalent in the Celtic countries. Manumissions were discouraged by law and the word for "female slave", cumal, was used as a general unit of value in Ireland. Archaeological evidence suggests that the pre-Roman Celtic societies were linked to the network of overland trade routes that spanned Eurasia. Archaeologists have discovered large prehistoric trackways crossing bogs in Ireland and Germany. Due to their substantial nature, these are believed to have been created for wheeled transport as part of an extensive roadway system that facilitated trade. The territory held by the Celts contained tin, lead, iron, silver and gold. Celtic smiths and metalworkers created weapons and jewelery for international trade, particularly with the Romans. The myth that the Celtic monetary system consisted of wholly barter is a common one, but is in part false. The monetary system was complex and is still not understood (much like the late Roman coinages), and due to the absence of large numbers of coin items, it is assumed that "proto-money" was used. This is the collective term used to describe bronze items made from the early La Tene period onwards, which were often in the shape of axeheads, rings, or bells. Due to the large number of these present in some burials, it is thought they had a relatively high monetary value, and could be used for "day to day" purchases. Low-value coinages of potin, a bronze alloy with high tin content, were minted in most Celtic areas of the continent and in South-East Britain prior to the Roman conquest of these lands. Higher-value coinages, suitable for use in trade, were minted in gold, silver, and high-quality bronze. Gold coinage was much more common than silver coinage, despite being worth substantially more, as while there were around 100 mines in Southern Britain and Central France, silver was more rarely mined. This was due partly to the relative sparsity of mines and the amount of effort needed for extraction compared to the profit gained. As the Roman civilization grew in importance and expanded its trade with the Celtic world, silver and bronze coinage became more common. This coincided with a major increase in gold production in Celtic areas to meet the Roman demand, due to the high value Romans put on the metal. The large number of gold mines in France is thought to be a major reason why Caesar invaded. There are only very limited records from pre-Christian times written in Celtic languages. These are mostly inscriptions in the Roman and sometimes Greek alphabets. The Ogham script, an Early Medieval alphabet, was mostly used in early Christian times in Ireland and Scotland (but also in Wales and England), and was only used for ceremonial purposes such as inscriptions on gravestones. The available evidence is of a strong oral tradition, such as that preserved by bards in Ireland, and eventually recorded by monasteries. The oldest recorded rhyming poetry in the world is of Irish origin and is a transcription of a much older epic poem, leading some scholars to claim that the Celts invented rhyme. Celtic art also produced a great deal of intricate and beautiful metalwork, examples of which have been preserved by their distinctive burial rites. Celtic mythology is the mythology of Celtic polytheism, the apparent religion of the Iron Age Celts. Like other Iron Age Europeans, the early Celts maintained a polytheistic mythology and religious structure. Among Celtic peoples in close contact with Rome, such as the Gauls and Celtiberians, their mythology did not survive the Roman empire, their subsequent conversion to Christianity, and the loss of their Celtic languages. Ironically it is through contemporary Roman and Christian sources that what we do know of their beliefs has come down to us. In contrast, those Celtic peoples who maintained either their political or linguistic identities (such as the Gaels and Brythonic tribes of the British Isles) did transmit at least vestigial remnants of the mythologies of their Iron Age forebears, which were often recorded in written form during the Middle Ages. Because of the scarcity of surviving materials bearing written Gaulish, it is surmised that the pagan Celts were not widely literate - although a written form of Gaulish using the Greek, Latin and North Italic alphabets were used (as evidenced by votive items bearing inscriptions in Gaulish and the Coligny Calendar). Caesar attests to the literacy of the Gauls, but also wrote that their priests, the druids, were forbidden to use writing to record certain verses of religious significance (Caesar, De Bello Gallico 6.14) while also noting that the Helvetii had a written census (Caesar, De Bello Gallico 1.29). Rome introduced a more widespread habit of public inscriptions, and broke the power of the druids in the areas it conquered; in fact, most inscriptions to deities discovered in Gaul (modern France), Britain and other formerly (or presently) Celtic-speaking areas post-date the Roman conquest. 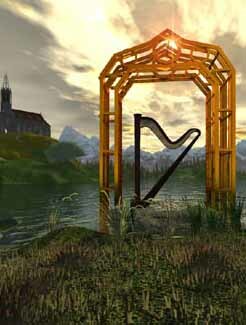 And although early Gaels in Ireland and parts of modern Wales used the Ogham script to record short inscriptions (largely personal names), more sophisticated literacy was not introduced to Celtic areas not conquered by Rome until the advent of Christianity; indeed, many Gaelic myths were first recorded by Christian monks, albeit without most of their original religious meanings. The classic entry about the Celtic gods of Gaul is the section in Julius Caesar's Commentarii de bello Gallico (52�51 BC; The Gallic War). In this he names the five principal gods worshipped in Gaul (according to the practice of his time, he gives the names of the closest equivalent Roman gods) and describes their roles. Mercury was the most venerated of all the deities and numerous representations of him were to be discovered. Mercury was seen as the originator of all the arts (and is often taken to refer to Lugus for this reason), the supporter of adventurers and of traders, and the mightiest power concerning trade and profit. Next the Gauls revered Apollo, Mars, Jupiter, and Minerva. Among these divinities the Celts are described as holding roughly equal views as did other populations: Apollo dispels sickness, Minerva encourages skills, Jupiter is in charge of the skies, and Mars influences warfare. In addition to these five, he mentions that the Gauls traced their ancestry to Dis Pater. As typical of himself as a Roman of the day, though, Caesar does not write of these gods by their Celtic names but by the names of the Roman gods with which he equated them, a process that significantly confuses the chore of identifying these Gaulish gods with their native names in the insular mythologies. He also portrays a tidy schema which equates deity and role in a manner that is quite unfamiliar to the colloquial literature handed down. Still, despite the restrictions, his short list is a helpful and fundamentally precise observation. In balancing his description with the oral tradition, or even with the Gaulish iconography, one is apt to recollect the distinct milieus and roles of these gods. Caesar's remarks and the iconography allude to rather dissimilar phases in the history of Gaulish religion. The iconography of Roman times is part of a setting of great social and political developments, and the religion it depicts may actually have been less obviously ordered than that upheld by the druids (the priestly order) in the era of Gaulish autonomy from Rome. Conversely, the want of order is often more ostensible than factual. It has, for example, been noticed that out of the several hundred names including a Celtic aspect testified in Gaul the greater part crop up only once. This has led some scholars to conclude that the Celtic deities and the related cults were local and tribal as opposed to Pan-Celtic. Proponents of this opinion quote Lucan's reference to a divinity called Teutates, which they translate as 'tribal spiri't (*teuta is believed to have meant 'tribe' in Proto-Celtic). The apparent array of divine names may, nonetheless, be justified differently: many may be mere labels applied to key gods worshiped in extensive Pan-Celtic cults. The concept of the Celtic pantheon as a large number of local deities is gainsaid by the numerous well-testified gods whose cults seem to have been followed across the Celtic world. Though the Celtic world at its greatest extent covered much of western and central Europe, it was not politically unified nor was there any substantial central source of cultural influence or homogeneity; as a result, there was a great deal of variation in local practices of Celtic religion (although certain motifs - for example, the god Lugh - appear to have diffused throughout the Celtic world). Inscriptions to more than three hundred deities, often equated with their Roman counterparts, have survived, but most appear to have been genii locorum, local or tribal gods, and few were widely worshipped. The oldest body of myths is found in early medieval manuscripts from Ireland. These were written by Christians, so the formerly divine nature of the characters is obscured. The basic myth appears to be a war between two apparently divine races, the Tuatha De Danann and the Fomorians, which forms the basis for the text Cath Maige Tuireadh (the Battle of Mag Tuireadh), as well as portions of the great pseudo-historical construct Lebor Gab�la Erenn (the Book of Invasions). The Tuatha De represent the functions of human society such as kingship, crafts and war, while the Fomorians represent chaos and wild nature. The gods of Britain, also obscured by centuries of Christianity, have come down to us in manuscripts from Wales. Here the two main groups of former gods are the children of Don and the Children of Llyr, although any distinction of function between the two groups is not apparent. The supreme god of the Celtic pantheon appears to have been the Dagda. The name means the 'Good God', not good in a moral sense, but good at everything, or all-powerful. The Dagda is a father-figure, a protector of the tribe and the basic Celtic god of whom other male Celtic deities were variants. Celtic gods were largely unspecialised entities, and perhaps we should see them as a clan rather than as a formal pantheon. In a sense, all the Celtic gods and goddesses were like the Greek Apollo, who could never be described as the god of any one thing. he name means the 'Good God', not good in a moral sense, but good at everything, or all-powerful. The Dagda is a father-figure, a protector of the tribe and the basic Celtic god of whom other male Celtic deities were variants. Celtic gods were largely unspecialised entities, and perhaps we should see them as a clan rather than as a formal pantheon. Irish tales depict the Dagda as a figure of power, armed with a club and associated with a cauldron. In Dorset there is a famous outline of an ithyphallic giant known as the Cerne Abbas Giant with a club cut into the chalky soil. While this was probably produced in Roman times, it has long been thought that it represents the Dagda. This has been called into question by recent studies which show that there may have been a representation of what looks like a large drapery hanging from the horizontal arm of the figure, leading to suspicion that this figure actually represents Hercules(Herakles), with the skin of the Nemean Lion over his arm and carrying the club he used to kill it. In Gaul, it is speculated that the Dagda is associated with Sucellos, the striker, equipped with a hammer and cup. 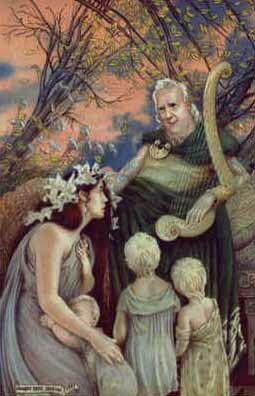 In the Irish branch of Celtic mythology, the Dagda's consort was known by various names. The most common of these was the Morrigan. Her name is pronounced in modern Irish as "More Ree-an"; in old Irish the 'g' was pronounced as a soft 'gh', like gamma in Greek. The name translates to 'Great Queen'. Sometimes she is referred to in the plural as Morrigna, but she was also known variously as Nemhain (Panic), Macha, Anann, and Badhbh Catha (Scald-crow of Battles), among other names. She was said to change into a crow or raven, also a horse, as well as she being an earth goddess, also soverignty, and a tutelary goddess - or goddess of the tribe. Macha has solar attributes, with her white horse, as a sun goddess. So, in essence, Morrigan is the "Queen of the Heavens" as well as Queen of the earth - so her powers extend to air and earth. Her battle aspect was discredited due to Victorian fallacy, as she is given the battle role for her reign over the battlefield giving the army of her favor aide, as well as military protection, and acting as the goddess of Soverignty, and not a battle goddess as so many Neopagans usually classify her. As well as her connections to the cauldron of rebirth, Daghda protects it, and it is said that those who partake of it never leave unsatisfied. The widespread diffusion of the god Lug (seemingly related to the mythological figure L�gh in Irish) in Celtic religion is apparent from the number of place names in which his name appears, occurring across the Celtic world from Ireland to Gaul. The most famous of these are the cities of Lugdunum (the modern French city of Lyon) and Lugdunum Batavorum (the modern city of Leiden). Lug is described in the Celtic myths as a latecomer to the list of deities, and is usually described as having the appearance of a young man. His weapons were the throwing-spear and sling, and in Ireland a festival called the Lughnasa (Modern Irish l�nasa) was held in his honor. The Celts also worshipped a number of deities of which we know little more than their names. Among these are the goddess Brigit (or Brigid), the Dagda's daughter; nature goddesses like Tailtiu and Macha; and Epona, the horse goddess. Male gods included Cu Roi and Goibniu, the immortal brewer of beer. Some of these gods and goddesses may have been variants of each other; Epona the Gallo-Roman horse goddess, for instance, may well have developed into the goddesses Rhiannon, in Wales, and Macha, who was mostly worshipped in Ulster. Polytheistic peoples rarely care to keep their pantheons in the neat and tidy order in which scholars would like to find them. Often it is said that the Celtic peoples built no temples, and worshipped only outside in groves of trees. Archaeology has long shown this is untrue, with various temple structures throughout the Celtic world being known. With the Roman conquest of parts of the Celtic world a distinct type of Celto-Roman temple called a fanum also was developed. This was distinguished from a Classical temple by having an ambulatory on all four sides of the central cella. The early Celts considered some trees to be sacred. The importance of trees in Celtic religion is shown by the fact that the very name of the Eburonian tribe contains a reference to the yew tree, and that names like Mac Cuilinn (son of holly) and Mac Ibar (son of yew) appear in Irish myths. Roman writers stated that the Celts practiced human sacrifice on a fairly large scale and there is peripheral support for this in Irish sources; however, most of this information is secondhand or hearsay. There are only very few recorded archaeological discoveries which substantiate the sacrificial process and thus most contemporary historians tend to regard human sacrifice as rare within Celtic cultures. There was also a warrior cult that centered on the severed heads of their enemies. The Celts provided their dead with weapons and other accoutrements, which indicates that they believed in an afterlife. Before burial, they also severed the dead person's head and shattered the skull, perhaps to prevent the ghost from wandering. Priests from this class were in charge of a great deal of religious festivals, as well as organizing the calendar; a daunting task as the Celtic calendar is incredibly accurate, but required manual correction about every 40 years, meaning lengthy mathematic discourse. There are many questions arising as to what calendrical practice was used by the Celtic people. Regarding this issue there are three primary schools of thought. These three theories all attempt to offer us a better understanding of the Celtic calendar. To use the term 'Celtic calendar' is somewhat inaccurate, as it were the Druids who were primarily concerned with calendar-keeping. Most archaeologist and historians accept another calendar. This calender is represented by the surviving fragments of a great bronze plate, the Coligny Calendar, which originally measured 5 feet by 3-1/2 feet. This plate, found in eastern France, was engraved in the Gaulish language (similar to Welsh) in Roman-style letters and numerals. It depicts a system of time keeping by lunar months, showing 62 consecutive months with 2 extra months inserted to match the solar timetable. They appear to have worked with a 19-year time cycle that equaled 235 lunar months and had an error of only half a day. The third school of thought is an amalgam of both of the others. The proponents of this last theory believe that the first calendar pre-dates the Coligny discovery. It is from ancient writers such as Caesar that we learn that the Celts were to have counted by nights and not days and in reckoning birthdays and new moon and new year their unit of reckoning is the night followed by the day. Ancient Celtic philosophy believed that existence arose from the interplay between darkness and light, night and day, cold and warmth, death and life, and that the passage of years was the alternation of dark periods (winter, beginning November 1) and light periods (summer, starting May 1). The Druidic view was that the earth was in darkness at its beginning, that night preceded day and winter preceded summer a view in striking accord with the story of creation in Genesis and even with the Big Bang theory. Thus, Nov. 1 was New Year's Day for the Celts, their year being divided into four major cycles. The onset of each cycle was observed with suitable rituals that included feasting and sacrifice. It was called The Festival of Samhain - linked with Halloween. 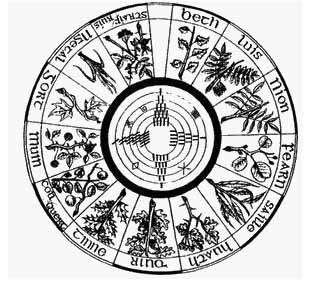 The Celts measured the Solar year on a wheel, circle or spiral, all of which symbolize creation and the constant movement of the universe � growth and development. To the ancients, the heavens appeared to wheel overhead, turning on an axis which points to the north polar stars. At the crown of the axis, a circle of stars revolved about a fixed point, the Celestial Pole, which was believed to be the location of Heaven. At the base of the axis was the Omphalos, the circular altar of the Goddess' temple. The universe of stars turning on this axis formed a spiral path, or stairway, on which souls ascended to Heaven. This Sunwise, clockwise, or deiseal (Gaelic), motion of the spirals represented the Summer Sun. The continuous spirals with seemingly no beginning or end signified that as one cycle ended another began � eternal life. The spiral's never-ending, always expanding, motion also symbolized the ever- increasing nature of information and knowledge. Many of these symbols often also appeared in triplicate, a sign of the divine. The social structure of Iron Age Celtic society was highly developed. It was a tribal society that was bonded together by a complex system of laws and social customs. The established body of Law was known as 'Fenechas', the law of the Feine (Freemen), or more commonly, the Brehon Laws. This body served the People for centuries. The most common body of Brehon Laws was codified in 438, by the order of Laighaire, a High King of Ireland. The proceedings by which this work was done by three Kings, three Brehona (Recitors of the Law), and three Christian missionaries. By this act Pagan Fil� and Christian monks came together and worked out a set of laws that was workable for people of both religions. The body of that law has been transmitted to us in the volumes known as the Senchus Mor. The body of Law known as Brehon Law, as contained in the Senchus Mor is a body of national law. However, national law was secondary to local law. Whether local or national it was the Brehons who acted as the recitors of the Law. There has been some confusion about who acted as the judge. It was the nobility who acted as such. As stated the Brehons were the recitors of the Law. After the Brehon had recited the Law, only then could the King or Queen render a decision. This is why lore is replete with examples of the Kings or Queens Druid, actually the Ard-Fili, having the right to speak before the King. If the Brehon, who was a member of the intellectual/skilled caste, recited the law incorrectly they were expected to forfeit their fee and pay damage costs. The Brehon laws were responsible for regulating how people interacted. Hospitality, etiquette and other things were set out in ways that left little room for doubt. The codes of behavior established in the Law was such that all members of a family had to adere to it. Codes of behavior and levels of responsibility were laid down in the laws for each social group. The more responsibility a social group had, the more restrictions were placed on them. Status was determined by the ownership of cattle and a few other things. There was no concept of land ownership in early Celtic society. This stands in sharp contrast to the Roman and Anglo patterns. Druids also carried out sacrifices of crops, animals, and during specific festivals, humans. In a Celtic society, people were not executed for crimes, except during these festivals. Such executions varied, depending on what god the execution was dedicated to. Among the most famous is the human sacrifices practiced in the course of Essus worship. Essus was, more or less, a benevolent law god to many Celts, particularly Gauls. However, Essus worship also intoned a sense of merciless behavior toward repeated criminals, rapists, traitors, and other societal dregs. The offender, if found guilty, would be taken to the temple of Essus, where an oak would be growing through an opening in the temple roof. His stomach would be cut open, and he would be hung from an oak branch. The Celts' gods were often named after natural things. For example the source of rivers would often have their own goddesses, though rarely many gods. Another theme with Celt gods were triple deities; not only goddesses, but numerous gods. For example the Mothers of Britain, or Cromm Cruach's slovenly, deific, and humanistic forms. The main deities of Celtic religion, contrary to much misconception, were usually male. The world in some remaining myths is often depicted as having been forged by a god with a hammer, such as Dagda or Sucellos, who then poured all life from a magic cauldron or cup; a source of pre-Christian Holy Grail' myths in Celtic societies. While deities varied, several constant deities or demigods existed over a wide area. A great example is Lugos, a heroic sun god from Gaul and the southern, Gallic parts of Britain. He is also known as Lugh (in Ireland), Llew (in non-Gallic Britain), and Lug (among Celtiberians, who were not culturally true Celts). Early depictions of him exist as early as the Hallstatt era, suggesting him as one of the longest existing gods of Celtic religion. Similar is the horse and fertility goddess, Epona, who was also worshipped by the Romans when they came to rule Gaul. She also seems to have existed from the early era. Finally, there is Sucellos, who is argued by some to have been the 'creator of the universe' in some Celtic religions. He is party to Dagda of Ireland, and was worshipped over an enormous area, including by non-Celtic peoples such as the Lusitani. He was the patron god of the Ordovices tribe of Britain, and was built up by the Arverni and their allies to replace the druidic god Cernunnos, as the Gallic druids were allies of their enemies in the rule for Gaul; the Aedui. Other religious practices also existed; Celts seem to have universally removed body hair. Some postulate this as religious, but was more realistically part of the Celtic propensity for cleanliness. Body hair kept dirt close to the body, and Celts were an extremely cleanly people, so this was unacceptable. However, Celts also took heads from dead enemies. This was definitely a religious practice in origin. However, even post-Christian Gaels continued this practice into the middle ages; some Irish even took to scalping the heads that they took, so they could braid the scalp through rings on their weapons. The religious connotations by that point were slim, but it does imply that taking heads had incredible cultural importance to have persisted so long after the religious background had been removed. Celts believed the soul resided in the head, and that capturing a head meant that one captured the soul of an opponent, and that when a Celt died, the dead whom he had collected would serve him as slaves for eternity. The ancient Celts had a form of writing called ogham (pronounced OH-yam). It was the writing of Druids and Bards. Ogham is also called 'Tree Alphabet' because each letter corresponds to a tree and an associated meaning. The letters were, in fact, engraved onto sticks as well as larger standing stones. In keeping with Druidic concepts, each of the Ogham's twenty letters bears the name of a tree. A-Ailim (Elm), B-Bithe (Birch), C-Coll (Hazel), for example. The Celts had an oral tradition so it was not used to write stories or history as these were memorized. The Ogham alphabet contains twenty letters and is read from the bottom up. The letters are constructed using a combination of lines placed adjacent to or crossing a midline. An individual letter may contain from one to five vertical or angled strokes. Vowels were sometimes described as a combination of dots. The midline was, most often, the edge of the object on which the inscription was carved. Ogham was named after the Celtic god of literature, Ogma. It was used on the edges of burial stones and boundary markers. They usually held the name of a person. Examples exist to this day. It was also used on rods or strips of wood that were fastened together at one end. These wands were opened and closed to present stories or poems. Since these wands were made of wood, none survive today. Only the messages on stone survived. The wooden sticks with the Ogham marking were used for divination similar to the way Runes were used by Norse peoples. Only the Druids and Bards understood the system and could have great influences on their people when they demonstrated its power. There are 369 verified examples of Ogham writing surviving today. These exist in the form of standing stones concentrated in Ireland, but scattered across Scotland, the Isle of Man, South Wales, Devonshire, and as far afield as Silchester (the ancient Roman city of Calleva Attrebatum). 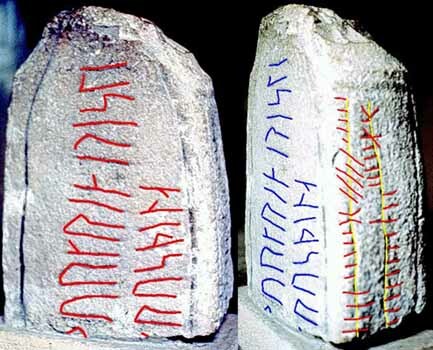 Similiar markings have been found on standing stones in Spain and Portugal. The markings in Spain are believed to be much older than the ones in Ireland, perhaps dating from 800 BC. It is from this area of the Iberian Peninsula that the Celts who colonized the British Isles may have come. Ogam can still be seen inscribed on hundreds of large and small stones, on the walls of some caves, but also on bone, ivory, bronze and silver objects. The Ogam script was especially well adapted for use on sticks. Sticks are part of the Basque word for "alphabet": agaka, agglutinated from aga-aka, aga (stick or pole) and akats (notch). The meaning of the word agaka therefore isn't so much "alphabet" as "writing", a stick with Ogam notches conveying a message. The name Ogam likely comes from oga-ama, ogasun (property, wealth) ama (Priestess, mother) property of the Priestess, which indicates that the script was originally designed for use by the clergy of the pre-Christian religion. Ogam was adopted and further developed by the first monks in Ireland. Our earliest information indicates that they were not sure as to where Ogam came from. According to the "Auraicept" the origin of Irish and Ogam must be sought in the Near East: "In Dacia it was invented, though others say it was in the Plain of Shinar" (line 1105-06). A "made in Ireland" version is recorded in "In Lebor Ogaim" in which the inventor is "Ogma mac Elathan who is said to have been skilled in speech and poetry and to have created the system as proof of his intellectual ability and with the intention that it should be the preserve of the learned, to the exclusion of rustics and fools" ( McManus 8.4). The script was used by the monks as a monument script between 450 and 800 A.D. and they used it for literary purposes between 650 and 900 A.D. Every time the script was inscribed in stone it must have been used thousands of times on sticks, for which medium the script was obviously designed. Over 500 Ogam inscriptions are known from Ireland (collected by R.A.S. Macalister), some 40 from Scotland ( A. Jackson) and a growing number from the east coast of North America. The fact that not a single one has been successfully translated is not so much the fault of the monks who wrote the texts, as of our linguists, all of whom assumed that the language of the script was Gaelic. However, this assumption appears to be without foundation, because the syntax of the Gaelic language in no way lends itself to be written in traditional Ogam. The Serpent's Stone is a symbol of an ancient wisdom and fidelity; touchstone of universal truths. The complexity of earthly life sometimes obscures a simple truth. The four serpent heads emerge from the labyrinth of Creation to point the way through self-examination. The brilliant colours convey a sense of drama and intrigue. As a meditative glyph, it endorses the need for self-examination. Thus when truth becomes entangled in a moral dilemma, evoke the secret wisdom of the Serpent's Stone. The basic economy of the Celts was mixed farming, and, except in times of unrest, single farmsteads were usual. Owing to the wide variations in terrain and climate, cattle raising was more important than cereal cultivation in some regions. There is strong archeological evidence to suggest that the pre-Roman Celtic nations were tied into a network of overland trade routes that spanned Eurasia from Ireland to China. Celtic traders were also in contact with the Phoenicians, gold works made in Pre-Roman Ireland have been unearthed in archeological digs in Palestine, and trade routes between the Celtic nations and Palestine date back to at least 1600 BC. Local trade was largely in the form of barter, but as with most tribal societies they probably had a reciprocal economy in which goods and other services are not exchanged, but are given on the basis of mutual relationships and the obligations of kinship. Though they had a written language, the Ogham script, it was only used for ceremonial purposes and they produced little in the way of literary output. Instead, Celtic peoples preferred the oral Bardic tradition. The oldest recorded rhyming poetry in the world is of Irish origin and is a transcription of a much older epic poem, leading some scholars to claim that the Celts invented Rhyme. They were highly skilled in visual arts and Celtic art produced a great deal of intricate and beautiful metalwork, examples of which have been preserved by their distinctive burial rites. In some regards the Atlantic Celts were conservative, for example they still used chariots in combat long after they had been reduced to ceremonial roles by the Greeks and Romans, though when faced with the Romans, and in the Atlantic islands their chariot tactics defeated the invasion attempted by Julius Caesar. Textiles in ancient times were fairly advanced. Weaving is a very basic technology and was quite advanced as early as 5,000 BCE, and brightly colored dyes were readily available. If we met our Celtic ancestors, they would probably look as gaudy to us as they did to the Romans, since they were very fond of bright colors and ornamentation. There aren't a lot of textile remains found for Celtic clothing from prehistoric times through the 16th century; we mostly have to rely on manuscripts and descriptions of what was worn at various times. However, I will make some educated guesses based on textile construction techniques from the few Celtic finds available, as well as evidence from the bog finds in Denmark, which could arguably be either Celtic or Teutonic. Celtic Art is a difficult term to define, covering a huge expanse of time, geography and cultures. A case has been made for artistic continuity in Europe from the Bronze Age, and indeed the preceding Neolithic age however archaeologists generally use "Celtic" to refer to the culture of the European Iron Age from around 1000 BC onwards, until the conquest by the Roman Empire of most of the territory concerned, and art historians typically begin to talk about "Celtic art" only from the La Tene period (broadly 5th to 1st centuries BC) onwards. "Early Celtic art" is another term used for this period, stretching in Britain to about 150 AD. The Early Medieval art of Britain and Ireland, which produced the Book of Kells and other masterpieces, and is what "Celtic art" evokes for much of the general public in the English-speaking world, is called Insular art in art history. Both styles absorbed considerable influences from non-Celtic sources, but retained a preference for geometrical decoration over figurative subjects, which are often extremely stylised when they do appear; narrative scenes only appear under outside influence. Energetic circular forms, triskeles and spirals are characteristic. Much of the surviving material is in precious metal, which no doubt gives a very unrepresentative picture, but apart from Pictish stones and the Insular high crosses, large monumental sculpture, even with decorative carving, is very rare; possibly the few standing male figures found, like the Warrior of Hirschlanden and the so-called "Lord of Glauberg", were originally common in wood. Also covered by the term is the visual art of the Celtic Revival (on the whole more notable for literature) from the 18th century to the modern era, which began as a conscious effort by Modern Celts, mostly in the British Isles, to express self-identification and nationalism, and became popular well beyond the Celtic nations, and whose style is still current in various popular forms, from Celtic cross funerary monuments to interlace tattoos. Coinciding with the beginnings of a coherent archaeological understanding of the earlier periods, the style self-consciously used motifs closely copied from works of the earlier periods, more often the Insular than the Iron Age. Another influence was that of late La Tene "vegetal" art on the Art Nouveau movement. 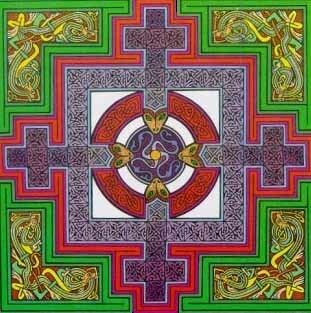 Typically, Celtic art is ornamental, avoiding straight lines and only occasionally using symmetry, without the imitation of nature central to the classical tradition, often involving complex symbolism. Celtic art has used a variety of styles and has shown influences from other cultures in their knotwork, spirals, key patterns, lettering, zoomorphics, plant forms and human figures. As the archaeologist Catherine Johns put it: "Common to Celtic art over a wide chronological and geographical span is an exquisite sense of balance in the layout and development of patterns. Curvilinear forms are set out so that positive and negative, filled areas and spaces form a harmonious whole. Control and restraint were exercised in the use of surface texturing and relief. Very complex curvilinear patterns were designed to cover precisely the most awkward and irregularly shaped surfaces". 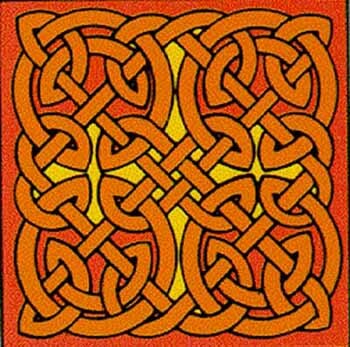 The most common error is to talk of Celtic knotwork, that complicated and elaborate interlacing of lines, curves and geometric shapes which seems to be appearing everywhere nowadays. This style of design and decoration was in fact brought to Britain in the 6th century AD by Saxon Christian monks and was used exclusively to illuminate the handwritten Christian Gospels. The Saxon people used some of the art for personal decoration. Any of the knotwork that has animal shapes incorporated shows influence from the Vikings. It is indeed a very attractive and distinctive style of decoration - but it is not Celtic. In Pre-Celtic Britain, there are many ancient places that were elaborately and painstakingly decorated and carved with many different styles of spiral, zig-zag, diamond, line and curve but nowhere do these separate symbols and designs overlap or interlace and nowhere is there to be found an example of knotwork. It should also be noted that these elaborate designs and symbols are not Celtic either. They were carved into the rocks by an unknown race of megalith builders thousands of years before the Celtic culture arrived. It is also a common practice for modern day Celtic groups to employ various symbols, such as the Crescent and V-Rod, the Switch, the Two Worlds etc, as part of their Celtic regalia and ritual but, once again, these ancient symbols are not Celtic they are Pictish. The Picts were a scandinavian people and the only places where these symbols are to be found, carved on stones etc, are in the North East of Scotland and they are, therefore, as foreign to the British tribes as the 'Celtic' knotwork is. Another modern addition to this confusing collection of symbolism is the ubiquitous pentagram which is unquestionably non-Celtic - Jewish, from the seals of Solomon. What, then, were the symbols used by the Celts? It is true that they greatly admired all art-forms and decorative styles and that they used these to a great extent on just about everything from household utensils to battle-chariots. But the symbols they used are the ones that are still all round us today :-the trees, the birds, the animals, the hills and lakes and all the other manifestations of the life-force on Earth. The Celts were a warlike, passionate people with a love of art. 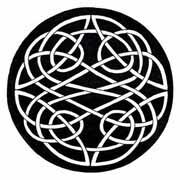 Truly, Celtic art is distinguished for its extensive curves and intricate knot work which is used to form complex decorations for weapons, jewelry and body tattooing. Along with the extensive use of body tattooing the Celts highlighted their naturally fair hair by washing it in lime-water. This fondness for art and personal decoration was merged with acts of barbarism, such as beheading their enemies and carrying the severed heads around the necks of their horses. The head was the ultimate source of spiritual power; to posses the enemies head, was to posses his spirit. Riding naked on fast moving, light chariots, shreiking and swinging large hacking swords and throwing spears was a most effective method of warfare for instilling terror into their enemies. Celtic art is art associated with various peoples known as Celts speaking the Celtic languages in Europe from pre-history through to the medieval period and beyond, as well as art of ancient peoples whose language is unknown but where cultural and stylistic similarities lead archaeologists to consider it probable that they were predecessors of those known to speak Celtic languages, and Celtic revival art from the 18th century to the modern era which began as a conscious effort by Modern Celts to express self-identification and nationalism. Celtic art is ornamental, avoiding straight lines and only occasionally using symmetry, without the imitation of nature or ideal of beauty central to the classical tradition, but as far as we can understand it often involves complex symbolism. It includes a variety of styles and often incorporates subtly modified elements from other cultures, an example being the characteristic over-and-under interlacing which only arrived in the 6th century when it was already in use by Germanic artists. There are three "traditions" of Celtic art, the first being the continental Iron age art mainly associated with La T�ne culture which draws on native, classical and (perhaps via the Mediterranean) oriental sources. The second, Iron age art in Britain and Ireland, draws on the continental tradition while adding distinctive regional styles. The third, the Celtic "renaissance" of the early Middle Ages in Ireland and to a lesser extent in parts of Britain, borrows heavily from Roman motifs. This third tradition formed the basis for the relatively recent Celtic revival art. Celtic music is a broad grouping of musical genres that evolved out of the folk musical traditions of the Celtic peoples of Western Europe. The term Celtic music may refer to both orally-transmitted traditional music and recorded popular music with only a superficial resemblance to folk styles of the Celtic peoples. Most typically, the term Celtic music is applied to the music of Ireland and Scotland, because both places have produced well-known distinctive styles which actually have genuine commonality and clear mutual influences. The music of Wales, Cornwall, Isle of Man, Brittany, Northumbria and Galicia are also frequently considered a part of Celtic music, the Celtic tradition being particularly strong in Brittany, where Celtic festivals large and small take place throughout the year. Finally, the music of ethnically Celtic peoples abroad are also considered, especially in Canada and the United States. The history of Celtic Warfare spans from c. 10th century BC up to the first few centuries AD and it concerns the distinct styles of warfare of the peoples known as Celts. It concerns the armed conflicts of the Celtic tribes and their kingdoms. Apart from conflicts between Celts and neighboring nations and tribes, numerous inter-tribal conflicts were recorded among Celtic tribes also.This includes the Celtic peoples of Ireland, Britain, Gaul, Iberia, and Anatolia. The scope of this article does not extend to the Britons and Gaels of the Sub-Roman to Medieval period. Celtic tribes fought amongst each other and sometimes they allied themselves with the Romans, the Greeks and other peoples against other Celtic tribes. Tribal warfare appears to have been a regular feature of Celtic societies. While epic literature depicts this as more of a sport focused on raids and hunting rather than organized territorial conquest, the historical record is more of tribes using warfare to exert political control and harass rivals, for economic advantage, and in some instances to conquer territory. Archaeology provides much information regarding the material culture of the Celts, but the significance of these finds in determining how the ancient Celts actually fought is the subject of much speculation. It was long thought, for instance, that the Celts were headhunters but recent research from France has indicated that it may have been the heads of slain allies that were collected to be placed in porticos, while the defeated were dumped in mass graves, their weapons ritually broken. Celtic warriors were drawn from what we would describe as the middle and upper class. The warrior class did the actual fighting: the free poor served as chariot drivers. The Celt was a warrior in the heroic sense. Everything had to be larger than life. He lived for war. His glorification of bravery often led him to recklessness. Part of a warriors ritual was to boast of his victories, and fighting between warriors was an important part of life. Most Celts scorned the use of armor and before about 300 B.C. preferred to fight naked. Some Celtic tribes still fought naked at the battle of Telamon in 225 B.C. The Celt was renowned as a swords-man but he also used javelins and spears. Two spears which were found at La Tene in Switzerland were nearly 2.5m long. His only protection was his large shield which was usually oval. The suggestion that the Celt wore heavy bracelets in battle has to be questioned, as it is hard to understand how they would stay on his arm whilst he wielded his sword. Dionysius tells us that in battle the Celts whirled their swords above their heads, slashing the air from side to side, then struck downwards at their enemies as if chopping wood. It was this use of the sword that so terrified their enemies. The Celts did not fight in a rabble as is so often supposed. They were organized in companies. This can be proved by their use of standards. The Celt was a head-hunter. In battle he would cut off the head of his fallen enemy and often hang it from his horse's neck. After battle he would display the severed head at the entrance to his temple. The severed head is a constant theme in Celtic art. At the battle of Beneventumin 214 B.C. the Roman general Gracchus had to order his army of freed slaves (presumably Celts) to stop collecting heads and get on with the fighting. After a battle the Celts would often dedicate their enemies weapons to the gods and throw them into a river or lake. The hundreds of weapons that have been dredged from the Lake of Neuchatel at La Tene were such offerings. In fact the site at La Tene has revealed so many Celtic artifacts that its name has been given to the whole Celtic culture. The chiefs and the wealthiest Celts often did wear armor particularly when they came into contact with the Greeks and Romans. They often adopted items of Greek or Roman armor. A pair of greaves were found in the chieftain's grave at Ciumesti. Several graves have been found in Northern Italy which contain Etruscan armour and Celtic weapons. Before a battle the chiefs would ride out, in front of the army clashing their weapons on their shields, proclaiming their great deeds and challenging the enemy to single combat. Caesar describes the British as dressed in skins (meaning leather) and decorated with woad, a blue dye. Some tattooed skin from a Scythian grave of this period suggests that the Britons were tattooed in blue. Diodorus Siculus, in his 1st century History had this to say about Celtic head-hunting: "They cut off the heads of enemies slain in battle and attach them to the necks of their horses. The blood-stained spoils they hand over to their attendants and carry off as booty, while striking up a paean and singing a song of victory; and they nail up these first fruits upon their houses, just as do those who lay low wild animals in certain kinds of hunting. They embalm in cedar oil the heads of the most distinguished enemies, and preserve them carefully in a chest, and display them with pride to strangers, saying that for this head one of their ancestors, or his father, or the man himself, refused the offer of a large sum of money. They say that some of them boast that they refused the weight of the head in gold; thus displaying what is only a barbarous kind of magnanimity, for it is not a sign of nobility to refrain from selling the proofs of one's valor. It is rather true that it is bestial to continue one's hostility against a slain fellow man."